"As a little girl, I watched in wonder as my mother and grandmother stood at the mirror paying meticulous attention to their skin. As a woman, I'm proud to take those traditions and combine them with clinically proven science to create an ultra luxurious skincare line for all women. I am humbled to be able to bring this hybrid of ancient and modern skincare to women of all complexions and cultures." Kimora is a life long skin enthusist and while her Grandmother taught her everything she knows about skin care she also admires her Grandmothers strict regime for luminous skin - which is held very tightly - has allowed her to develop this skincare line. The secret lies in OMEGAPEARL-18®, an exclusive, clinically proven anti-aging complex formulated from Pearl Powder, Wakame Kelp and Beta-Glucan Mushroom to combat one of the most problematic concerns of pre-mature aging – skin inflammation. 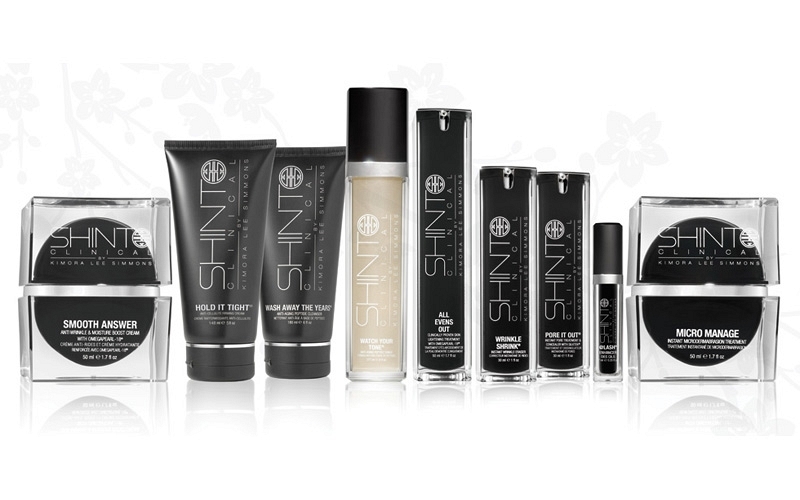 Shinto Clinical is packed with anti-oxidant/anti-inflammatory ingredients that have been fused into state-of-the-art delivery systems to rejuvenate and nourish skin. I love kimora lee simones so if this line comes to Canada I would try it out. Definitely would love to know if this line is going to be expanded! Me either until I was snooping the net lol! as always. By the time we get something it's old.